Welcome to our Smooch parlour! Smooch was born out of a love and passion for creating fun, dreamy and delicious ice cream. We are not milking it, but Smooch is made from 100% Real Dairy creamy goodness (no udder ingredients added). Smooch ice creams sold daily! Using the best of dairy ingredients and with a world of toppings, customers can create the Smooch of their dreams. Made from 100% Real Dairy ice cream, the Smooch philosophy is simple; choose your base flavour, then follow one of our great tasting recipes to create your own unique creation! Smooch’s creamy goodness has our customers coming back for more, a phenomenon we call ‘Twice Cream’! Smooch’s extensive menu offers your customers a wide range of product formats. This includes whipped soft serve ice cream, milkshakes, classics (99’s, Sundaes and Screwballs) and any creation of your own! Everybody loves ice cream especially when it is this much fun. Watch as your choice of chocolate bar gets turned into a thick creamy milkshake or your favourite soft serve ice cream gets blended with your selection of toppings. 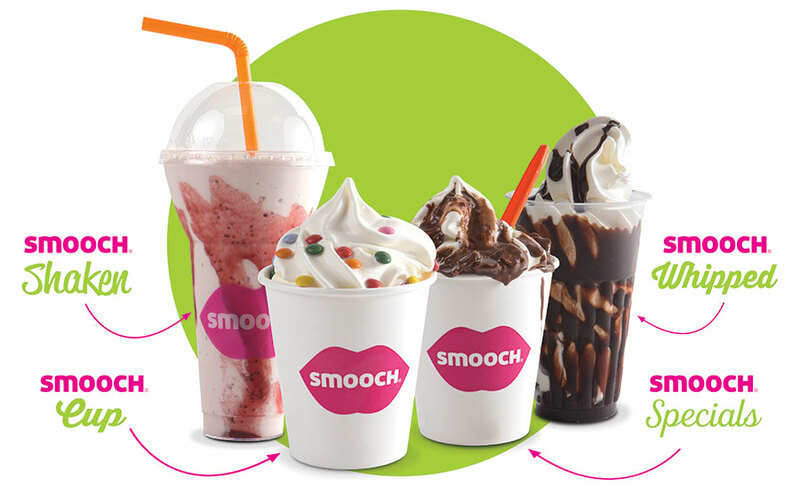 Our Smooch ice cream parlours are designed to fit within your current retail offering. All aspects of the unit are created for operational ease of use, with everything you need at your fingertips. The addition of a Smooch ice cream parlour in your store will generate profitability within a traditionally low volume space.